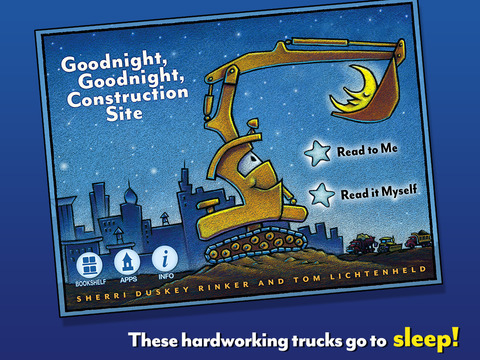 Goodnight, Goodnight, Construction Site by Sherri Duskey Rinker and Tom Lichtenheld is a classic bedtime story, published in print in 2011. Now, it’s a delightful children’s bedtime app. 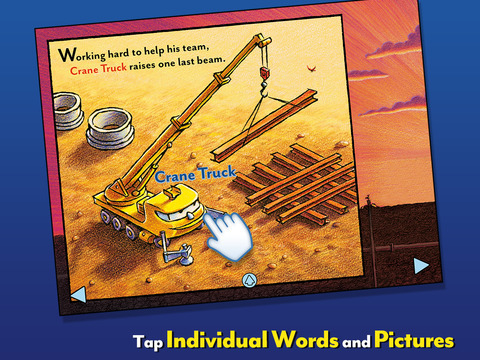 Created by Oceanhouse Media, this book app has all the same elements children love plus movement, sound effects, and some delightful surprises. The app brings the book’s illustrations to life with small movements and sound effects, but not so much that they distract from the story. At the beginning, you are able to choose to read for yourself or have a narrator read to you. As the narrator reads, each word in the text is highlighted. A touch to anything on the screen brings up the noun for the object and the narrator says it, including any of the words in the text. Some of the object touches bring up not just the word, but an action as well: a vehicle rumbles, puddles splash, the bird sings. 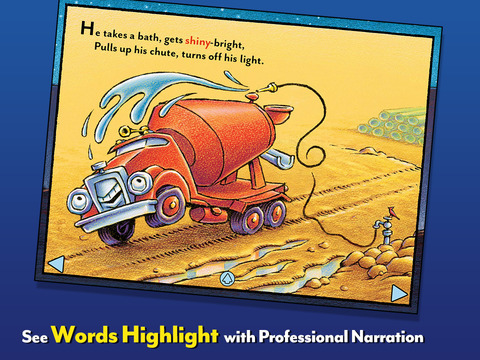 Great vocabulary shows up, with words like “spigot” and “cardinal.” Lest you think that all this might be too exciting for little ones you’re trying to get into bed, be assured that the narrator’s voice is very soothing and the yawning and gentle snoring the vehicles were doing was enough to make me yawn in sympathy! As much as I love this app for the story alone, the thing that tips it into fantastic is that it allows you to record your own voice reading it. I can just imagine grandparents reading this for grandchildren or a traveling or military parent being able to read their child to sleep from hundreds of miles away. The app also lets you email your recording. This record function is very easy to use. The info section on the home page tells you how to do it, but the interface is so simple that I didn’t need instructions to figure it out. Even better, more than one person can record the story. The voice options screen, accessible through the little blue arrow on the center bottom, allows you to choose which narrator you’d like to hear from. The last person to record is the default for narration. The only thing I disliked, and it was a preference really, were the home screen buttons for the Bookshelf, which offers an app to corral your OM apps, and Apps, which takes you to the app store. I’d have liked the ability to eliminate these from the screen. 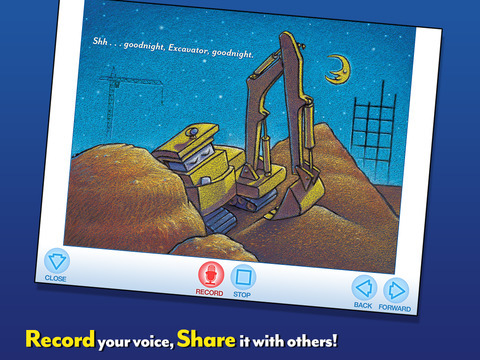 I’m a cheapskate, and don’t usually pay much for apps, but this is totally worth the $3.99 price tag, especially if you’d like someone far away to be able to read to your child each night. LittleeLit is a collaborative think tank of professionals thinking about the topic of young children, new media, and libraries. Individuals who share their viewpoints, experiences, and presentations in Little eLit blog posts are expressing their personal views and do not represent Little eLit as a whole.